I’m realizing that working out with a newborn is not an easy task! There is so much pressure to get your pre-baby body back…but without workouts, it’s going to be a challenge. So, what is a new mom to do? Fit it in whenever you can! As a trainer, I’ve usually been against those notions of “fitting in” workouts here and there – even if it’s just 5 minutes at a time. I have always felt (and still do to some extent) that to really get in shape – you need to devote at least 30 minutes or so to working out each day – or at least enough time to break a sweat. However, I’m starting to rethink this theory, since I literally have only 5 or 10 minutes of free time in one block before I have to take care of my baby. So, here are some of the things that I have been doing lately and some tips to get you closer to your pre-baby body! 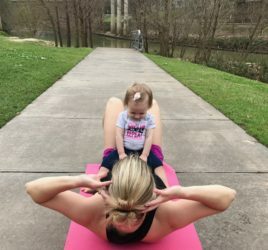 Try working out when your baby is napping. I know this is hard -because it’s tempting to sleep (which I often do) – but try to do it earlier in the day during one of your baby’s first naps. Take your baby monitor with you and already be in your workout gear (this saves time). Do a quick workout in your living room, garage or other area of the house that won’t disturb baby. I like to fit in a quick circuit while my baby is playing in his bouncy chair so that I can keep an eye on him and offer some entertainment! I do something like this: 30 squats, 10 pushups, 20 reverse lunges, 10 tricep dips (on my stairs), 30 second plank hold. I count out loud (it makes my baby laugh!) and try to do as many rounds as I can before he gets fussy. Ask your partner to watch the baby first thing in the morning (if you haven’t been up all night) before they have to go to work – so you can go for a quick run. Or do this in the evenings (after you’ve had some naps during the day). It makes me feel 10x better when I get out and get some sun and fresh air. Try to go to the gym – even if it’s just once a week. Working out at home is a great start and is better than waiting for the perfect time (or amount of time) to hit the gym. But – if you can get to the gym, even just once a week – it will do you some good. If you are able to go – hit the machines. Don’t do free weights or cardio – because you can do that at home. Instead, use your time wisely and do a weights circuit with machines and/or weights that you don’t have at home. Just remember that this time with your newborn won’t last forever – which is bittersweet. I get frustrated a lot because I don’t have an hour or two to workout each day like I used to – but I know there will be plenty of time for that in the near future and I remind myself that I want to enjoy this special time. 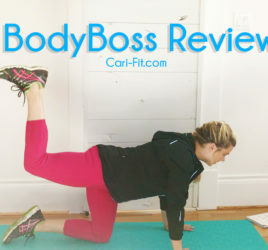 Just remember that when it comes to postpartum workouts – some is better than none. Fit in workouts when you can and when you are able to do more – you can. Don’t rush things and also remember you can control what you eat – so try to eat as healthy as possible and you’ll reach your goals soon!